What It Is: This cardio kickboxing abs routine is the best way to mix up your abs routine and give unwanted belly fat a one-two punch (don’t forget to pair it with a healthy diet for best results)! Why You Need It: Let’s face it, crunches aren’t the most effective and those plank challenges are super boring (and they can really cause poor form). This multi-tasking routine saves you time and maximizes your calorie burn by combining your cardio and core work into a single workout (plus, it’s kind of fun too!). What It Is: A metabolic conditioning circuit that’s designed to burn fat and build strength at the same time with just 5 multi-muscle, heart pumping moves (along with some targeted, bodyweight only core conditioning at the end). Why You Need It: If you are tight on time but still need to squeeze in a good, sweaty strength session – this is it! These total body exercises will not work every muscle in your body, they’ll keep your heart rate up too for a bigger calorie burn for one seriously efficient 30 minute workout. What It Is: A flowing blend of Pilates and Yoga moves designed to keep your heart rate more elevated than more traditional mat practices without losing the mind/body benefits of both styles. Why You Need It: Try this one in between a cardio or strength training day to provide a beneficial, lower intensity session that still adds variety along with additional core strength development. You’ll feel pleasantly worked yet full of energy for your next tough training day. What It Is: A fun, invigorating (and surprisingly challenging!) barefoot cardio workout that’s a welcome change from the treadmill. Why You Need It: If you’ve started to dread your cardio sessions, or think you can’t get in a great calorie burner without killing yourself with HIIT, give this one a try. You might just start to look forward to your workouts again. What It Is: A flowing, feel good session that’s designed to get your blood flowing and gently work out stiff, sore muscles. Why You Need It: Being sore from a great workout is normal, and rest is needed to help build strength, but lying on the couch all day on your rest day never helped anyone get more fit! Stay in motion on your day off without overdoing it with this gentle recovery day routine. Want more free workouts just like these? Be sure to SUBSCRIBE to our YouTube Channel JESSICASMITHTV so you don’t miss a single new workout! Did you try any of the workouts? Let me know in the comments below! Hi I’m Noela from Australia! – Just did the ballet cardio workout – really great! I’m 51 and in the best shape of my life, thanks to regular exercise and doing your workouts in particular. This ballet cardio looks pretty simple, but boy did it give me a great all over workout and at the end I feel fabulously stretched and lengthened. Looking forward to tomorrow when I can do another workout with you and Peanut (by the way, my little dog Coco now joins me for my workouts in our study! no kidding! 🙂 ). Thank you for such great workouts and please keep up your great work. I started working out for over a year. I had knee surgery in 2016. I knew I did not want to wait too long after surgery. I am 56 and staying in shape is a way of life. You are an amazing instructor. Easy to follow and super motivating. I just had another major surgery in March. I just started to test the waters. To my surprise I am much stronger than I thought. Thanks to your excellent, challenging, and doable workouts. My favorites are the barre,cardio, and sculpting workouts. Looking forward for more great workouts. The kickboxing challenged me to be more coordinated and keep my heart rate up. This program was from 5 exercise routines to add to our mix. I wanted to try a different routine from your other ones on YouTube. The kick boxing was a great workout and I’ll add it to my mix. My wrist is recovering from a break in January and has weight bearing restraints. Your programs from jessicasmithtv on YouTube give me the variety I want. Hello! I found your workouts after searching for low impact and lower intensity workouts I could do. I have recently been diagnosed with adrenal fatigue (stage 3) and no matter how much I workout and what I eat (I eat plant-based and workout consistently) I don’t get results. What I am wondering is if you have a recommendation for workouts for someone with adrenal fatigue in which I could get results? Thank you! You are amazing! I am a recently retired woman of 63 years. I discovered your workouts on youtube two months ago and I exercise every day now for an hour. I already see a lot of changes in my body, losing weight, getting stronger and leaner! 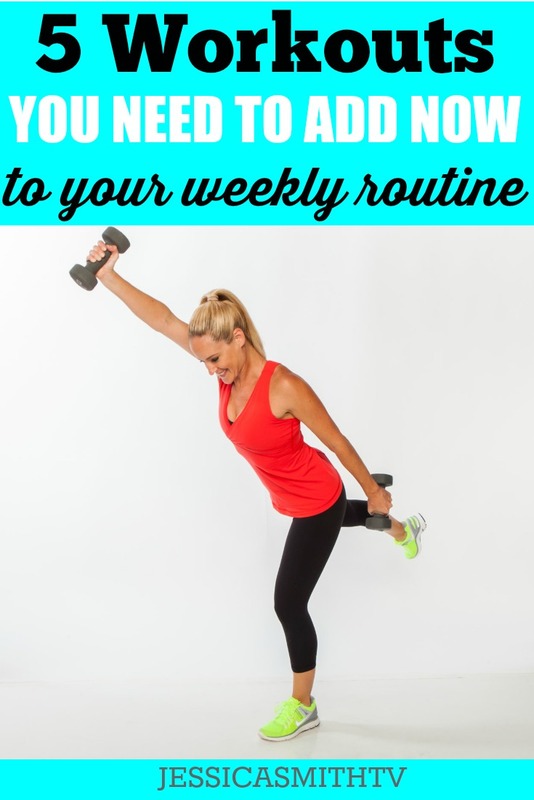 Your videos are easy to follow and the all the different exercises make it easy to hold on! You are so positive and kind and a pleasure to watch and I love peanuts. I’m on week 3 of the 30 minute walking videos. I’m 47 and I’ve had a difficult time taking off the weight like I used to. I’m used to being around 123 lbs and now I’m 134, which I’ve gained quickly once I started going through menopause. Should I scrap the walking exercises and start doing other exercises. I’m getting really discouraged. Anyone else having a similar experience? Thank you all for comments and your help! I love your YouTube workouts and your DVDs. Just did MetCon for the 2nd time. Love it! Just when you think it is over you hit us with great ab work that really made me sweat! Jessica, I have been exercising for 21 years. I used to be very competitive with myself and anyone around me. I had to be the fastest and go the furthest. A workout didn’t count unless I was at the gym and it had to be hard. However as I have aged, my ability to exercise at that level has become difficult plus I don’t really like it. In addition sometimes it is not possible for me to get in my full hour which I defined as a failure in my mind. I became really frustrated with myself but I have found you and your YouTube page and I have started to realize that you don’t have to kill yourself to get a good workout. In addition you taught me that I can still get a great workout in much less time. You have taught me that strength and even Yoga and pilates can be cardio. I absolutely love working out with you and Peanut. I promote your page whenever I can. Thank you for redefining exercise for me and making me enjoy working out again! Love to hear that Kim! Keep up the great work you are doing taking care of your body and your health 🙂 Thanks for moving with us! What a great combos of exercises!! I will definitely share this post. Just finished the 48 minute exercise with the ball. What a great exercise routine. I thought throughout it that I couldn’t make it but I did! I have been using your workout DVD’s for quite a while now and also your You Tube video’s to workout. I have lost 68 pounds and am at my goal weight. I am 64 years old and in August of last year finished 3 years of chemo treatments so to be able to keep up with you although very difficult is such a blessing. Thank you for continuing to push us to better health. Your workouts have changed me. So Inspiring g and fun too! Another great workout routine! I never get bored working out with you Jessica. Thank you for motivating me to keep moving!!! just did the 20 min Recovery routine after 3days of not exercising due to a bug. This is THE perfect recovery from anything workout. I feel so much better. I’ll get back into the routine tomorrow! Thank You Jessica! Just wanted to tell you Jessica that I love exercising with you everyday. I have told so many people about your webpage. I thank you for keeping me motivated. On a side note I have a Westie that loves to see Peanut when I exercise.